Rio Grande’s Harry Reilly and Midway’s Stephan Peuterbaugh battle for a loose ball during an Oct. 27 River States Conference men’s soccer matchup in Midway, Ky.
KANSAS CITY, Mo. – Two more shutout victories, coupled with a tie by top-ranked William Carey (Miss.) and a loss by No. 2 Oklahoma Wesleyan University, helped propel the University of Rio Grande into the No. 1 position of the latest NAIA Men’s Soccer Coaches’ Top 25 Poll released Tuesday afternoon by the national office. The RedStorm picked up seven of 18 first-place votes and finished with 485 points in the balloting of a panel of head coaches representing each of the conferences, Association of Independent Institutions and Unaffiliated Groups. Rio Grande (16-0), which officially secured the River States Conference regular season title by blanking Asbury University and Midway University last week, won’t play again until the semifinal round of the RSC Tournament after earning a first round bye as the top seed. Head coach Scott Morrissey’s team will face the survivor of Saturday’s RSC quarterfinal round matchup between No. 4 seed Asbury and fifth-seeded Indiana University East on Wednesday, Nov. 7, at Evan E. Davis Field. Rio Grande’s top billing – its 58th such ranking since 2000 – is an NAIA all-time best and its first No. 1 selection since the 2016 preseason poll. The RedStorm have also appeared in 116 consecutive Top 25 polls, a figure topped only by Lindsey Wilson College’s 126 straight appearances. William Carey (Miss. ), which had its perfect season end in a scoreless draw with Florida College last week, slipped to second place after receiving eight first-place votes and 483 points in the balloting. Central Methodist (Mo.) garnered the remaining three first-place nods and jumped from fifth place to the No. 3 position with 458 points. Oklahoma Wesleyan (456 pts.) dropped from second to fourth after suffering its second loss of the year, while Hastings (Neb.) fell from fourth to fifth after tallying 448 points. The Master’s (Calif.), Benedictine (Kan.) and Olivet Nazarene (Ill.) all had the biggest jumps of the week, moving up six spots each to fill positions 17-19, respectively. The University of Northwestern Ohio suffered the biggest drop for the week among the Top 25 teams, slipping seven slots from 17th to 24th. Madonna (Mich.), Science & Arts (Okla.), Kansas Wesleyan and Columbia (Mo.) were the four newcomers to the poll this week, taking spots 20, 21, 23 and 25, respectively. Southeastern (Fla.), Southwestern Christian (Okla.), William Woods (Mo.) and Reinhardt (Ga.) were the four teams which fell from the Top 25 list. For the ninth straight week, WVU-Tech was the only other RSC to receive mention in poll, finishing with 41 points for the equivalent of 31th place. NOTES: Mitchell Osmond was named the River States Conference Men’s Soccer Defensive Player of the Week for Oct. 22-28. A senior center back from Sydney, Australia, Osmond spearheaded a defensive effort which blanked Asbury 3-0, and Midway 5-0. The third-ranked RedStorm did not allow a single shot versus Asbury. 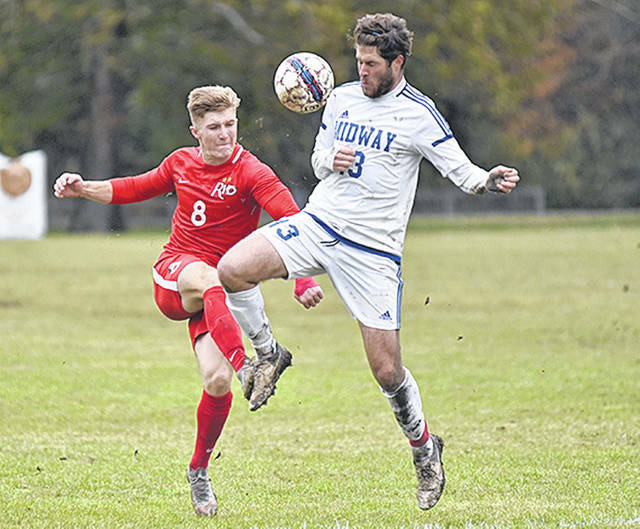 The win over Midway completed a regular season with only two goals given up by Rio Grande, one of which was a penalty kick. Rio Grande (16-0-0, 9-0-0 RSC) is the No. 1 seed in the upcoming RSC Men’s Soccer Championship. The RedStorm has a bye into the semifinals where it awaits the winner of No. 4 Asbury versus No. 5 IU East.